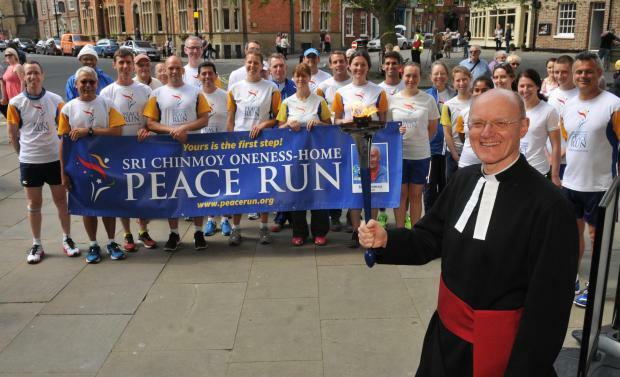 Sri Chinmoy believed in the underlying unity of the different world religions. To support the ideal of religious tolerance and religious unity, Sri Chinmoy participated in several interfaith activities and often spoke about the shared spiritual values of different religions. These are some examples of Sri Chinmoy’s participation in interfaith activities during his time in the West. The Parliament of the World’s Religions was first held in 1893 in Chicago. The historic gathering is regarded as the beginning of the interfaith movement worldwide. At this first Parliament, the Indian monk, Swami Vivekananda, captured the hearts and imaginations of all the participants with his powerful, all-embracing spirituality. 100 years later in Chicago, to celebrate the centenary anniversary, eight thousand people came together in Chicago for a second Parliament. Sri Chinmoy was chosen by the organisers to open the convocation with a few moments of silent meditation. The fourth Parliament of the World’s Religions was held as part of the Universal Forum of Cultures in Barcelona, 2004. Sri Chinmoy was once more invited to offer a silent prayer for the oneness of all religions, before the audience of seven thousand attendees. During his years of service at the United Nations, Sri Chinmoy participated in many interfaith events associated with the United Nations. On this occasion, Sri Chinmoy offers a silent introduction to the first international interfaith conference at the United Nations, October 24th, 1975. Several prominent religious leaders attended, including Mother Teresa. Sri Chinmoy participated in United Nations, World Day of Prayer observances, Interfaith Prayer breakfasts, Seven Minutes of Silence, and World Gratitude and International Thanksgiving Days. Sri Chinmoy also fostered dialogue amongst spiritual and religious leaders from all the main faiths around the world. For many years Sanjaya Spettigue offered a ‘Thought of the Day’ at the local BBC station, offering a spiritual perspective on topics ranging from the United Nations to Interfaith harmony. Sanjaya is chairman to Suffolk inter-faith centre which seeks to promote religious harmony and understanding. The episodes are collected on here on Radio Sri Chinmoy.